The catalog is titled Elastic Chairs and Settees for Opera Houses, Halls… and is by Elastic Chair Co. and dated September 1882. 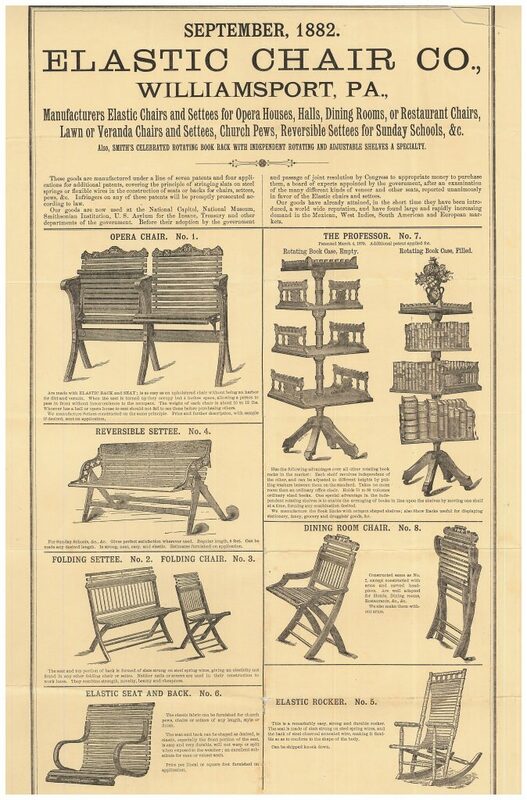 The catalog is just one over-sized page advertising various pieces of furniture sold by the company, like chairs, settees, rockers, and bookcases. One sentence in particular caught my eye. It was a sentence mentioning the Smithsonian Institution. It read, “Our goods are now used at the National Capitol, National Museum, Smithsonian Institution, U.S. Asylum for the Insane, Treasury and other departments of the government.” So according to this piece of trade literature from 1882, some of the furniture sold by Elastic Chair Co. might have been used at the Smithsonian. Unfortunately, we do not know exactly which pieces of furniture that might have been. Elastic Chair Co., Williamsport, PA. Elastic Chairs and Settees for Opera Houses, Halls…, 1882, chairs, settees, rockers, and bookcases. The catalog illustrates several pieces of furniture. These include opera chairs, reversible settees, and dining room chairs, some of which could also be folding chairs or folding settees. There was also a rocking chair called the Elastic Rocker, pictured on the bottom right of the page. But, working in a library, one item in particular caught my eye. It was a rotating bookcase called “The Professor.” The catalog states that it was patented on March 4, 1879. “The Professor” held seventy to eighty ordinary sized books. Each shelf revolved independently of the other shelves. Because there always seems to be at least one book that is just too tall to fit on the shelf, an advantage of the rotating bookcase was that the height of each shelf could be adjusted by using washers. The images show the rotating bookcase as both empty and filled with books. Elastic Chairs and Settees for Opera Houses, Halls… by Elastic Chair Co. is located in the Trade Literature Collection at the National Museum of American History Library. It is always interesting to see old trade catalogs. I sometimes think about collecting them, it feels like a good way to remember a piece of history. It’s cool that you mention the rotating bookshelf. I’ve never seen a catalogue with that in it before. I’ll probably keep looking for more historical catalogues, thanks for sharing.